Electrical Impedance Tomography (EIT) is used in a clinical context to visualize changes in ventilation distribution. Therefore, an array of electrodes is attached circumferentially around the patient's chest. Subsequently small alternating currents are injected into the patient's body and resulting voltages on the surface of the thorax are measured. 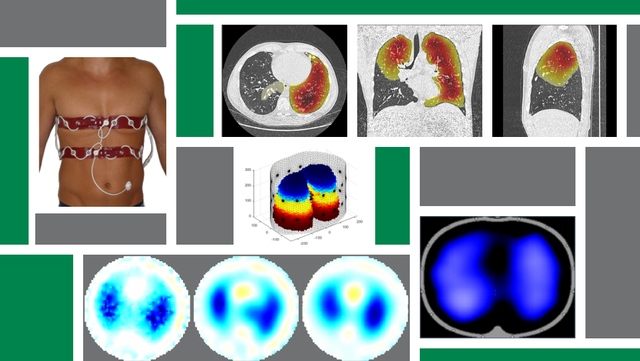 Mathematical reconstruction methods are employed to generate tomographic images depicting the current ventilation state of the patients lungs. EIT has already shown promising results for mechanically ventilated patients in the intensive care unit. Current research at ITeM focuses on its further use in this field but as well on the application of EIT in spontaneously breathing patients, which are suffering from obstructive lung diseases, e.g. chronic obstructive pulmonary disease (COPD) or asthma. A multidisciplinary team, consisting of mathematicians, engineers and biologists, develops methods for image reconstruction and signal processing in order to provide relevant information for physicians and other clinical staff.